Benign asbestos-related pleural diseases are the most common pathologic and clinical abnormalities related to asbestos exposure, with a greater prevalence than asbestosis. Solomon et al. 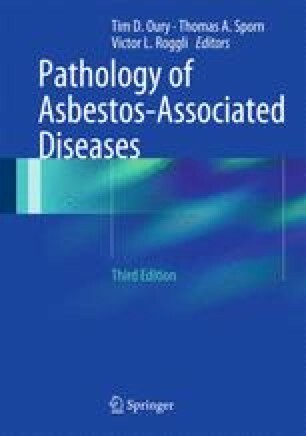 emphasized that the pleural manifestations of asbestos exposure include four specific benign pleural reactions: (1) benign asbestos effusion, (2) parietal pleural plaques, (3) diffuse pleural fibrosis, and (4) rounded atelectasis, or an area of collapsed, airless lung adjacent to an area of visceral pleural fibrosis. Notably, there is considerable overlap among these four disease processes (Fig. 6.1), with various combinations manifesting simultaneously or sequentially in a single individual. For example, a patient with benign asbestos effusion may subsequently be found to have diffuse pleural fibrosis, or a patient with parietal pleural plaques may develop rounded atelectasis.